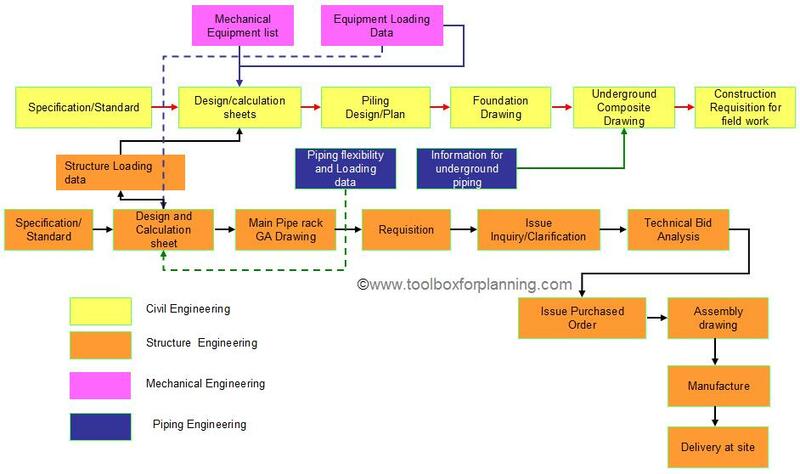 The basic concept of engineering work flow is essential to know developing engineering schedule. Once you have done adding activities and linking logically, you have done 70% of schedule development. Below diagram shows the linkages of civil/structure deliverables for EPC project. The in puts of civil design calculation sheets are specifications and standard, mechanical equipment loading data and structure loading data . Based on design calculation result, piling design documents are produced. The predecessor of underground composite drawing is information for underground piping, foundation information. The in puts of design and calculation sheet for structure engineering are piping flexibility and loading data from piping discipline, and mechanical equipment loading data from mechanical discipline. Successor of design and calculation sheet is structure GA drawing. Detail assembly drawings would be produced by vendor/subcontractor when the purchased order is issued. Pipe rack modules are begun to manufacture once assembly drawings are ready. Finally, main pipe racks are delivered to site. This concepts are applied when EPC level 3 schedule is developed. very helful. Thanks so much.